Earlier this year we asked the School Council to organise a competition to design a new school logo. The old logo has served us well but now we have a new one that we can be equally proud of. The winner of the competition was Josie and she is pictured here with the first Polo shirt made by the manufacturers. It was made up for me in rather a larger size that would fit Josie and in Navy Blue instead of our usual Royal Blue. It depicts a hand holding a book with the valley and mountains surrounding in the background. 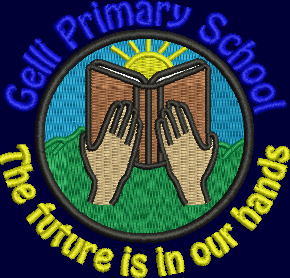 The school council thought that is summed up what we do in Gelli Primary, we help each other by supporting everyone with helping hands, also reading is a key to understanding everything we do in school. We also came up with a new vision statement - The future is in our hands. Congratulations Josie on winning the competition and for giving us a new beginning. The new School uniform is available in U-Design in Treorchy and Ystrad and in Topstitch in Ystrad. Here is the logo in more detail. We said goodbye to three members of staff this week who have been with us during the year. Miss Evans has been covering the maternity leave of Miss Mathias in Nursery. Miss Peppin has been job sharing with Mrs Dyer in Year 3. They have contributed so much to us this year we shall be sad to see them move on. We wish them well in future and hope that some day we will be able to accommodate them on our staff roster in the future. Mrs Davidge is leaving us after a long association which began when she was a 16 year old student in Treorchy Comprehensive School. She is taking a place on a PGCE course in UWIC Cardiff in September to train to become a teacher. We wish her well next year. At the end of term we were experiencing problems with our photocopier and we were unable to publish an end of term newsletter as usual. We shall be adding posts to this blog and updating our Social Networking feeds with updated news throughout the summer until the pupils return on TUESDAY SEPTEMBER 2nd 2014. Staff will be training on 1/9/2014. Breakfast Club will be open as usual from 8a.m. on the TUESDAY. May I take this opportunity to thank you on behalf of the staff for all the cards and presents we received at the end of term. They were really appreciated. We say a fond farewell to our Class of 2014. They have been excellent role models and they go to their new schools with our best wishes. New Council Leader Cllr Andrew Morgan has confirmed today at the meeting of the School Budget Forum that no amendments will be made to nursery provision during the next academic year. The Council currently provides one of the most generous levels of nursery provision in Wales. A letter from the education department to all parents, to be issued shortly, will confirm that if the Cabinet does seek to reconsider nursery admission funding in the coming months, the current arrangements will remain in place for the duration of the new academic year September 2014 to July 2015. "I have made clear previously that nothing is ruled in and that nothing is ruled out in terms of how the Cabinet may respond and proceed following the recent judicial review judgment relating to our decision to amend nursery funding. "I do however personally feel it is important that we inform parents what to expect in the coming academic year and I therefore have instructed Officers to communicate to parents, governors and schools that the current nursery admission arrangements will remain in place for the next academic year, that is until July 2015. "The severity of the public spending cuts we face means that as a Council we could potentially have no alternative other than to revisit this decision during the coming months. I am however aware of the uncertainty the current situation is causing and I therefore think it is only reasonable that we make clear the arrangements for the next school year, however we may decide to proceed on this matter in future after September 2015. "As we have made clear time and time again, we cannot avoid difficult decisions which will unfortunately impact on people and will inevitably be unpopular because of the dramatic reductions in funding we face. We should as a council however seek to bring people with us when we consider these unpalatable choices and that is why I think this reassurance in terms of the next school year is essential. Tough choices cannot be avoided but I want us to be reasonable in our approach to these difficult decisions. "By stating clearly the arrangements for the 2014/2015 academic year I hope we can engage constructively with the public around the difficult financial challenges we face and this could mean having to reconsider this area of provision for Rhondda Cynon Taf. This is especially so when many other Local Authorities in Wales have reduced their level of provision to that vastly below that currently offered by this Council. "The Council is now in receipt of the official transcript of the judicial review judgment which I have considered. Having done so I feel the only course of action we should reasonably take is to rule out any changes that would affect the new academic year to allow us to reflect on this very important and extremely contentious matter. "I also want to make clear that should Cabinet decide to reconsider this issue we would seek to initiate a fresh consultation with the public before doing so." "Based on what we currently think our funding levels will be next year, we face a £30M funding gap in the next year alone because of UK government cuts to public spending and we cannot therefore avoid making difficult decisions. As a new Leader I want us to be as reasonable as we can practically be in making these tough choices to ensure we communicate the rational and need for these decisions with the public. I hope by making the position clear in respect of the 2014/2015 academic school year it will ensure a more constructive dialogue with parents in the future." Just a reminder that SCHOOL WILL BE CLOSED TO ALL PUPILS on Thursday 10th July due to the above mentioned industrial action taken by the joint unions. School will recommence on Friday as usual. We needed to postpone our School Sports on Friday due to the adverse weather. We now propose to hold it on Wednesday 9th July at Pentre Astroturf, starting at 1.00 pm. Lunch will be at 11.30 a.m. EXCEPT FOR DOSBARTH 1 and 2. We would like parents to pick those pupils up from school at 11.30 and bring them to the Sports field by 12.45. We do not have sufficient staffing to transport them safely to the Astroturf. Other pupils will be walked up by staff, support staff and lunchtime supervisors. Pupils will be dismissed into the care of their parents at the end of the sports. Please will you make arrangements for this. Any pupil not collected will be brought back to school and dismissed from here as normal. I hope that these arrangements will be reasonable for most parents. There will be a £1 entry fee per adult which we will use towards purchasing medals for the winning team. Despite the planned industrial action our Second Annual Sports Awards will take place at the Ton Pentre Football Club on Thursday as planned for those pupils and parents that have been invited. We hope to welcome you to what will be an enjoyable evening. The Friends of Gelli Primary School Fete will be held in the school grounds on Saturday The Summer School fete will be held in the school grounds on Saturday 12th July 2014 to start at 11.00 a.m. We will be very pleased to receive donations for the following stalls – TOYS & GAMES especially Cuddly toys , TINS & BOTTLES, BOOKS RAFFLE PRIZES, articles for WHITE ELEPHANT STALL and CAKES All items donated to the fete can be brought to school from WEDNESDAY July 9th onwards, but the later the better as we have limited storage in school. The school will be open at 9.00 a.m. on the Saturday morning for all parents and friends who are responsible for running stalls to begin to set up either in the yard area or indoors if wet. This year we will be requesting each family to sell £1.00 of raffle tickets in the week leading up to the fete. This should ensure that we make at least £200 before we start and that these can be sold to friend and work colleagues to boost the funds. Mrs Sims will be very pleased to hear from any volunteers who will be able to give some help on any stall, especially new parents. You can contact her on 01443 431395.I hope that as many of you as possible can attend and support the school. Due to the uncertainty of the weather we have taken a decision to cancel the Sports today. School is open as normal and your child need not wear school uniform if they are in school in their Sports Kit. There are no Canteen facilities available today as you were requested to provide your child with a packed lunch. If you were planning to take your child home after the Sports this afternoon and have lunch at home then please do so. We are attempting to re-arrange the Sports for next week and will contact parents via text to confirm this. Thank you for your understanding in what has been a frustrating morning. We can arrange most things we cannot control the weather. Contingency Plans for the School Sports in case of rain. Looking at tomorrow’s weather forecast there is light rain forecast from early morning turning to heavy rain at 10 a.m. if this does not change we will have to re-arrange the school sports. Your child will need to be in school for registration and will walk to the Astroturf with members of staff. We anticipate that the event will finish at approximately 1pm. We will make a decision as early as possible and TEXT PARENTS BETWEEN 8.45 and 9.00 a.m. if we have to make alternative arrangements. • Pupils will be required to come to school as soon as possible. • There is NO provision for school dinners tomorrow; all pupils should bring a packed lunch as previously arranged. • Pupils will be dismissed from school as usual at the end of the day. • Sports kit may be worn if desired. If we decide to carry on with the sports and the weather turns against us we will continue with the sports regardless. I hope that this clarifies the situation and we can manage the situation as effectively as we can. 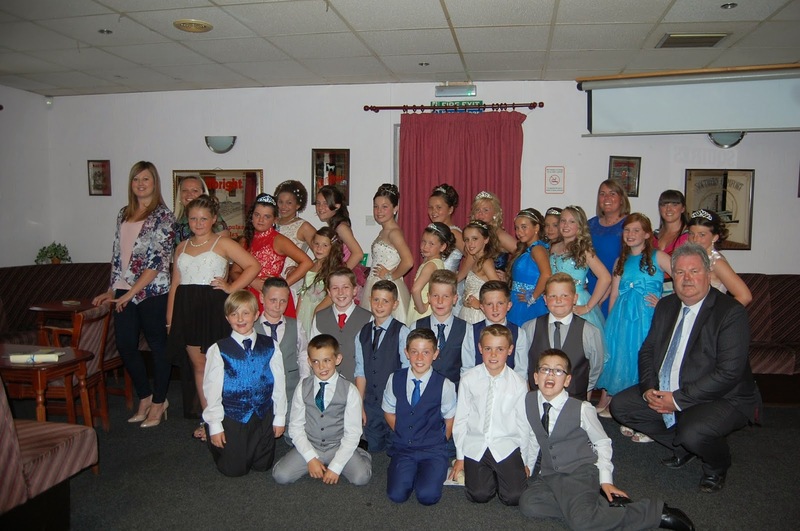 May I remind parents that the Leaver’s Ball is primarily for our Year 6 pupils but it is also an end of Year Disco for the whole school and parents to attend. This year it will take place on Wednesday 2nd July at the Ton Pentre Football Club from 6.00 p.m. until 9.00. p.m. This disco is open to ALL PUPILS. Children from Nursery through to Year 4 MUST be accompanied by a responsible adult (18+). During the evening, the presentations will be made to the Year 6 pupils who will leave to join their Comprehensive schools in September. Come along and help us give them a good “Gelli Primary” send off!! Entry is £1 per child. Hot dogs will be available on the night.